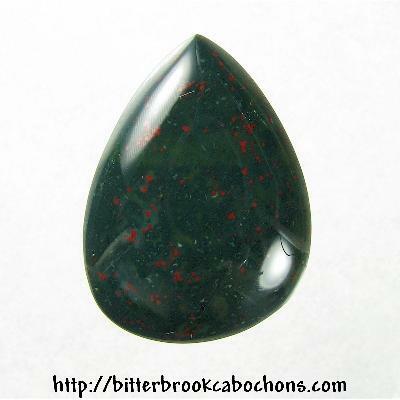 This little freeform cut Bloodstone cabochon has medium-dark green coloring with lots of drops of "blood," mostly on the left side. They are slightly more prominent than they appear in the photo. The areas at the top and lower right that look like scratches are actually light reflections. 32mm x 24mm x 6mm. Weight: 33.05 carats.